We made this craft when Kaitlyn was about 2 1/2 years old -- She's 4 1/2 now (yes, that's how long these things sit before I get them on the site sometimes *blush*). If you prefer, you can choose to make JUST the clock or JUST the mouse. If you're doing the craft with younger kids, you may want to make each part on a separate day (so they don't get tired). When we did it, we painted all the clock pieces and made the mouse on day 1. On day 2, we assembled the clock and added the mouse to it. ALTERNATIVE: substitute a Kleenex box for the 3 cardboard tubes. The mouse looked a lot like "Tutter" from bear in the big blue house when we were done. If you used blue wool it would be a very good likeness. I realize we used a very odd color for our clock, but Kaitlyn is really enjoying mixing her own colors (she calls it her "science"). This is equal portions of Crayola blue, green and red plus a double portion of white. Print out the clock face template. It's a "tracer page" so that young children can practice their numbers. It's a little bit smaller than I would have preferred, but it had to fit in the plate. if you're making the craft with older children, you can have them trace a circle... (an old CD is about the right size for tracing). Then have them print their own numbers on the circle -- you may want to pre-make an example so they can follow along how the numbers are arranged. Suggest to them that it's easier to do 3, 6, 9 and 12 first (the four corners) and then fill in the other numbers after. If you chose not to use the template, you'll have to make your own hands too. Cut out the clock face and the hands. 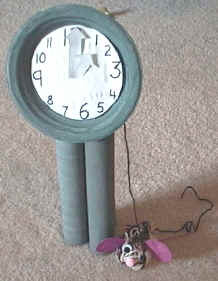 Either poke a hole with a pencil through the center of the clock (adults should do this part) and put the hands on with brass fasteners OR just glue the hands onto the clock, pointing to ONE O'CLOCK. If you use brass fasteners, you can have the kids turn the clock to TWO O'CLOCK, THREE O'CLOCK, etc as you sing the different verses of the song. 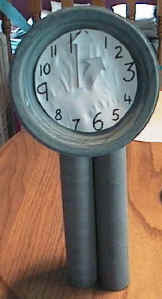 Tape the three tubes together in a triangular shape (this will make the clock sturdy enough to stand up on its own). 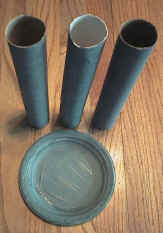 Glue or tape the paper plate to the top of the tubes. To make the clock even sturdier, you can cut a rectangular base out of a piece of cardboard and glue/tape the clock to it. At this point, an adult should poke two slits in the side/top of the egg carton. Cut out two ear shapes with tabs (like pink image beside these directions) out of a piece of cardboard. Don't worry about perfection! Cover with pink paper or paint pink. Shove the tabs from the ears into the sides of the egg carton cup. for this one, we didn't actually snip the ends... We just left it as a loop so his "fur" wasn't too wild. It's up to you which way you want to do it. apply glue LIBERALLY all over the egg carton cup and drape the yarn pom pom over top. 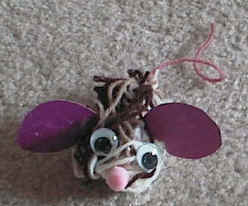 Tie a piece of wool that is 2 1/2 times the length of the clock onto the mouse. Put the wool through the clock. The child can pull the end of the wool to make the mouse climb up the OUTSIDE of the clock and let go of the wool so the mouse runs down. You can attach a craft stick or a straw to the end of the wool the child holds onto as a handle if you like.